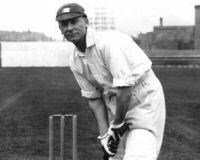 Description: Legendary England cricketer Sir Jack Hobbs (1882-1963) lived here. As an opening batsman he scored more first-class runs (61,237 per Wisden, 61,760 per Cricinfo) and more first-class centuries (197 per Wisden, 199 per Cricinfo) than any other cricketer. These records probably wont be beaten since modern cricketers now play fewer first class matches.